Pros and Cons of Radiant Floor Heating? If you’re looking for efficient heating that doesn’t break the bank and leaves your home with a clean looking finish, radiant floor heating is the ideal way to create efficient, even heat in your home without taking up space. Relatively easy-to-install and a cost-effective method to radiant heat, underfloor heating leaves your home feeling cozy, no matter the weather. Here’s a guide on how to go about choosing the right type of radiant floor heating for you. Radiant floor heating works to heat a room through the floor. It either works by installing electricity-powered coils under the flooring or implementing water-heated tubing. As a radiant heater, it works by heating the things it touches, meaning that by warming the floor, it will warm you as it radiates through objects. The air temperature tends to stay roughly the same, but everything in the room warms up. It can be installed under a whole variety of flooring, from laminate flooring to ceramic tiles, and can even be installed under carpet and hardwood. However, as radiant floor heating works by heating objects, the flooring material will make a difference to the amount of heat that it is able to generate and for how long. Porcelain and ceramic tiles will work with thermal mass, where the tiles will hold heat long after the heating is turned off. Carpet is thicker and not as good at heat conduction, making the underfloor heating less effective. Radiant floor heating can be powered by electricity or can work on a system of hydronics. 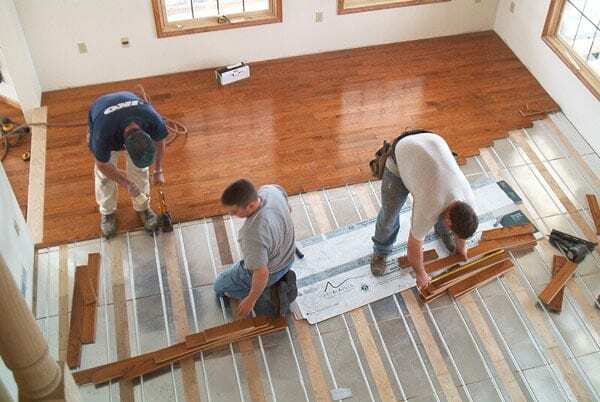 Electric radiant flooring works as a series of heating mats, usually around 20 foot by 12 foot. 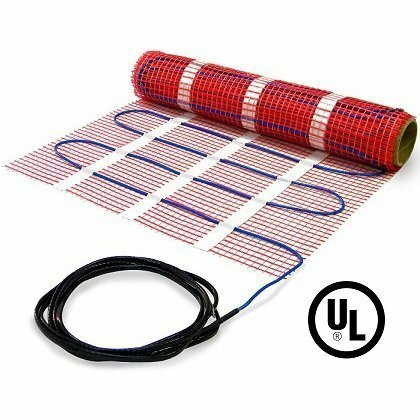 These heating mats are made of heat-conducting plastic that contains coils. These coils are typically made of copper or nichrome and are warmed by electricity. They are resistance wires, wrapped in a water-resistant polymer, and are fed through the matt in a zigzag pattern. Each mat is hooked up to its own thermostat, enabling variable functionality of the heating system. You can cut the mats to fit the room; however, you can only cut the plastic and never the wiring. 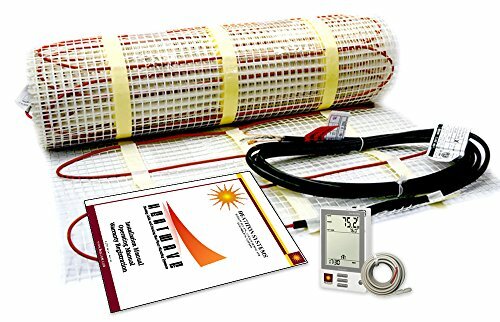 Hydronic radiant heating works by having water heated by a water heater or boiler that passes through plastic tubing that’s installed under the floor. This tubing can be installed under the subfloor and surrounded by concrete to take advantage of thermal mass, or simply installed with the subfloor and flooring installed above it. Hydronic floor heating that uses concrete takes much longer to heat up, because it heats the whole concrete subfloor, that when heats up, will hold the heat in the concrete, releasing it slowly as the room’s temperature drops. This keeps the room at a nice constant temperature. Radiant floor heating takes up far less space as is it hidden under the floorboards. Not only does it reserve space, it is also more aesthetically appealing. This type of heating, especially when using hydronic underfloor heating, is very efficient as it uses a system of thermal mass. When you use electric radiant floor heating, combining it with porcelain of ceramic tiles will also increase efficiency. Radiant floor heating can save up to 15% on bills due to even heating and energy efficiency. It can be used with pretty much all floor coverings, including carpet and hardwood. Electric radiant flooring is very easy-to-install; you simply lay the mats and hook it to a thermostat. Water-heated flooring is a little harder if you involve concrete but still not too difficult. It is safer for children and pets as you do not have to worry about them bumping into hot surfaces or knocking over space heaters. If you’re not comfortable with this kind of DIY, the installation costs can be a little expensive, especially for hydronic systems. Once installed, if you have a problem, it means taking up the floor, which is a real issue if you have laid tiles above your heating system. Each mat on an electrical system needs its own thermostat, which is inconvenient and a little costly. It increases the height of the floor which can be an issue if you have already installed doorways or if you’re particularly tall. From the outset, radiant heating is far quieter than forced air heating. Forced air heating systems are usually subject to the sound of the blower, whereas radiant systems heat the objects around them, warming the environment silently. That said, radiant heater tends to be slower as they heat individual objects while the heat spreads, whereas the effects of a forced air heater can be felt immediately because forced air heaters heat the air, and blow this heated air directly into the room. On that note, however, as the room heats quickly with a forced air heater, it also cools as slowly. When turned off, the air cools down quickly, and the room stays cold. With radiant heaters, thermal mass is held in the heated objects which radiates out for longer even when the heater is switched off. Moreover, forced air systems tend to leave an unequal heat distribution as the hot air rises quickly and cold air sinks to the bottom. This will often lead you to turn the heating up, using more fuel and costing more money. However, with radiant heating, objects are warmed slowly upward, creating a more evenly heated space. Another issue with forced air systems is with the fan that will circulate bacteria in the room. During the wintertime, when flu and colds are common, forced air heaters can create these kinds of health conditions. It is equally true for allergies, as forced air heaters blow allergens around a room. Radiant heaters don’t do it though. However, in terms of maintenance, it is far easier to repair a forced air heating system than a broken radiant heating system, because of the need to access the heating underneath the floor. Again, it is a big problem if you have tiles. Choosing radiant floor heating is a great step towards efficiency, but ensuring you have a top quality brand will reduce the need for constant maintenance. Here are some of the best systems available on the market. 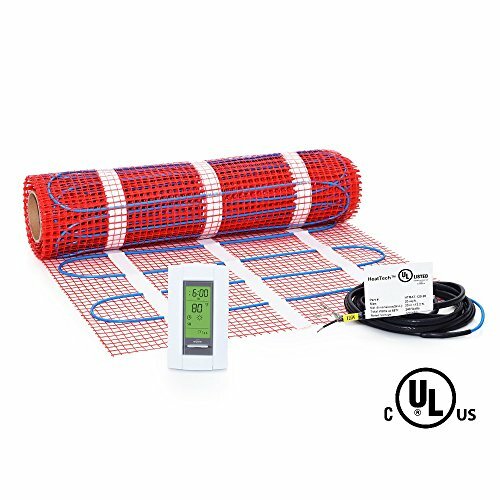 This radiant heating system comes with a Honeywell thermostat and has an adhesive backing for easy installation. It can combine with other mats to heat up to 150 square feet and comes with a 25-year warranty. It is very easy-to-install, with a simple plug and play system and adhesive backing. The heating cables are placed 3 inches apart which gives even and efficient heat distribution. The heating cables are only 1/8th of an inch thick which does not raise the floor too significantly. It is easy to operate once installed, and the thermostat gives great functionality and programmability. The thermostat can be a little tricky to set up. It needs enough mat to cover the whole floor, or it won’t do the job. Once you get past the hurdle of setting the thermostat up, it is easy to operate and works quite well. You will need enough mat to cover the whole floor, from where even heat will come up. 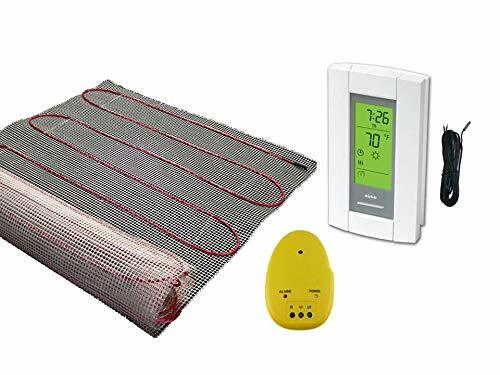 This model comes complete with a thermostat digital floor sensing thermostat, and has cuttable mesh. With ⅛ inch wires spaced 3 inches apart this model gives even electric-powered heating. The thin wires don’t raise the floor significantly. Installation and wiring of these mats are very simple. The mesh can be cut to fit spaces that are not square (you cannot cut the wire). The mat is not adhesive, and it tends to have trouble laying flat when being installed. The thermostat is not very accurate, and the mat doesn’t really go above 73F, though it says 75F. This mat is easy-to-install and can be customized to fit your space. That said, the lack of adhesion makes it a little more difficult to set in the right place. Once installed, it operates well, but the thermostat isn’t as accurate as it could be. With only ⅛ inch thick cables spaced 3 inches apart, this model has an output of 12 watts per square foot. It is UL listed and has a 10-foot cold lead. It is adhesive making installation far easier. It can be installed under a variety of flooring and still remain energy efficient. 150 square feet of mats can be linked together on one thermostat for more easy operation. It is compatible with a variety of different brands of thermostats so you can choose your favorite. You will need to purchase your own thermostat as it doesn’t come with one. Some customers have complained that it is often delivered without instructions, which makes it hard to install if you have no previous experience. This mat can go under all types of flooring, and the adhesive backing makes it easy to put down. There is no thermostat with this model, but it is compatible with many brands so you can choose the best one for you. This model comes with a 7-day programmable thermostat, which has floor and ambient sensor modes. The cables are ⅛-inch thick, placed 3 inches apart, and the self-adhesive mats are suitable for wet areas. The self-adhesive compound on the mats makes it easier to install. The instructions are easy to follow, making it effortless to put in and to use. It maintains a constant temperature no matter the fluctuation of heat outside. It comes with a thermostat that allows for good functionality and automatic programming. Without enough of this matting, you’ll end up with cold spots. The thermostat cannot be set to turn the temperature on and off, only to change the temperature. Between the self-adhesive mats and the simple instructions, this system is easy-to-install. The temperature stays constant and even, but you have to make sure you cover the whole floor to avoid cold spots. This model pumps out 12 watts of power per square foot and has a 15-foot cold lead to hook up to the electricity. It is only 1/8th of an inch thick and comes with a limited lifetime warranty and a programmable thermostat. This model heats large spaces evenly. It has a long cord to reach the electrical input. It uses very little energy, giving even heat with high energy efficiency. There is a separate alarm that can be installed to let you know if there is damage to wiring. Installation can be a little intensive. There are no instructions to show how to operate the thermostat. This model is great for larger spaces and has added features to help with maintenance. The installation is a little tricky, but once you master it, you’ll find you have good even heating. Not only is radiant floor heating very efficient, giving constant, even heat, it also aesthetically pleasing, taking up no room space. It may be a little tricky to install if you’re a DIY first-timer, however, you’ll find it far easier than you ever would have thought. Unlike forced air heaters, you’ll enjoy silent, even heat that’s simple to adjust using a thermostat. Be aware that any repairs may require taking up the floor so make sure to ask a professional if you’re unsure about installation.